Do you love all the farmhouse decor that’s so popular these days?? When we remodeled our house a few years ago, I ended up with a large, blank, windowless wall in our living room. I had no idea what to do with it (remember the lack of talent in the decorating arena?? ), so I lived with it for 3 years and pondered. Just a little background on my lack of the decorating gene… we lived in a farmhouse south of town for 4 years and I didn’t hang a single thing in the living room the entire time we lived there!! And we had a GIANT blank wall! Yeah…. 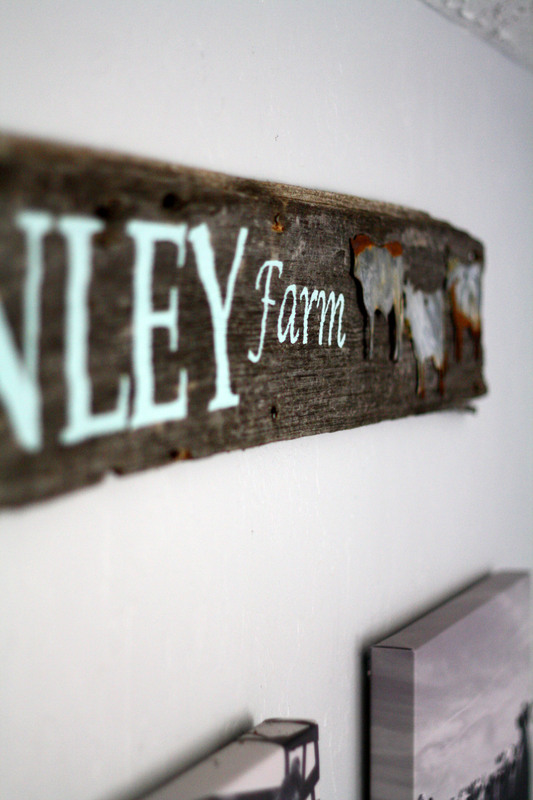 Anyway, back to my original story and how to get that trendy farmhouse style the easy way! I knew whatever went on this wall needed to be BIG. I tossed around the idea of a gallery wall, but the decision making process of what pictures to put up and how to arrange them left me positively paralyzed. Well, last winter, my sister and I took a roadtrip to Pawhuska to see The Merc. (Unless you’ve been living under a rock during the last 5 years, you all know what The Merc is, right??? lol). Upstairs, it’s decorated with all of these large black and white canvases with ranching scenes. So, I started mulling that over, but canvases are EXPENSIVE, so I didn’t do anything about it. 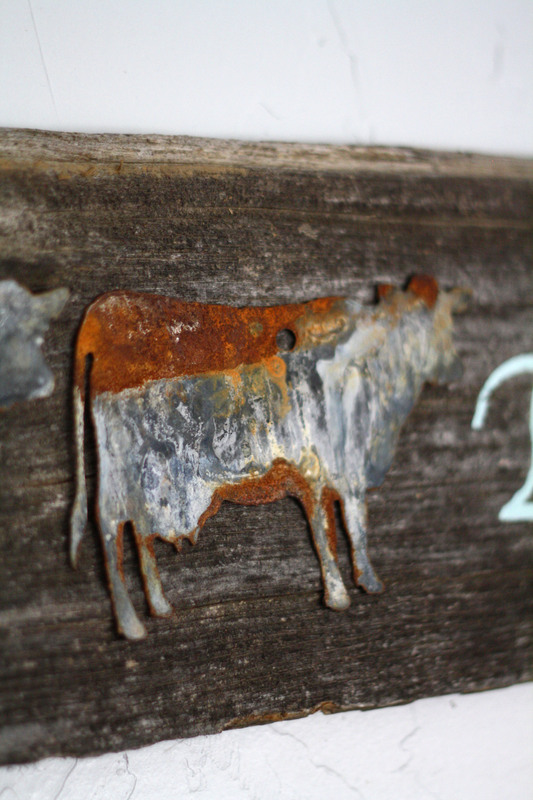 The other thing that I’ve absolutely been loving is all the signs on barn wood. And guess what we have a lot of around here? 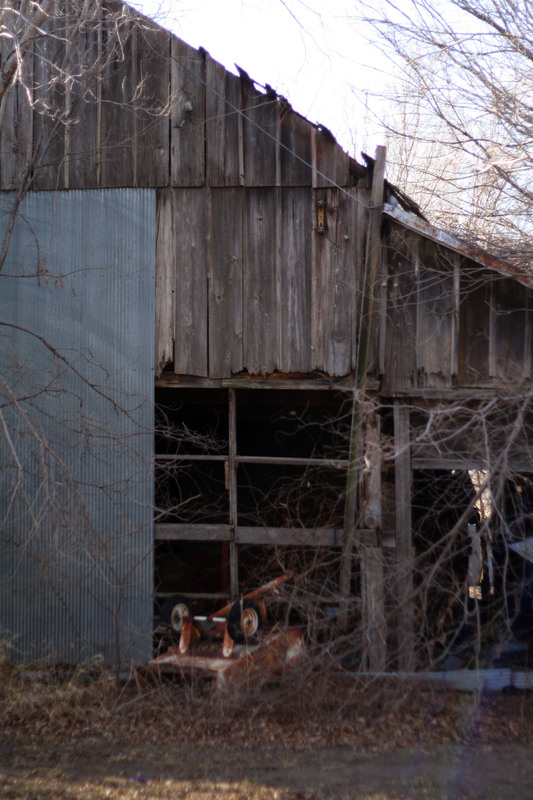 On an old farm with two falling down barns, I could have my pick of barn wood. But, I didn’t know what it should say or how to go about making it exactly. In the meantime, though, my sister and I attended The Vintage Home Market Days up in Wichita last spring and I came away with quite of bit of inspiration and 5 old tin cut outs of cows (two bulls and 3 cows, to be exact). And then in June, Snapfish ran an amazing deal on 16×20 canvases! $20 each! So, I went through my pictures and picked out 3. 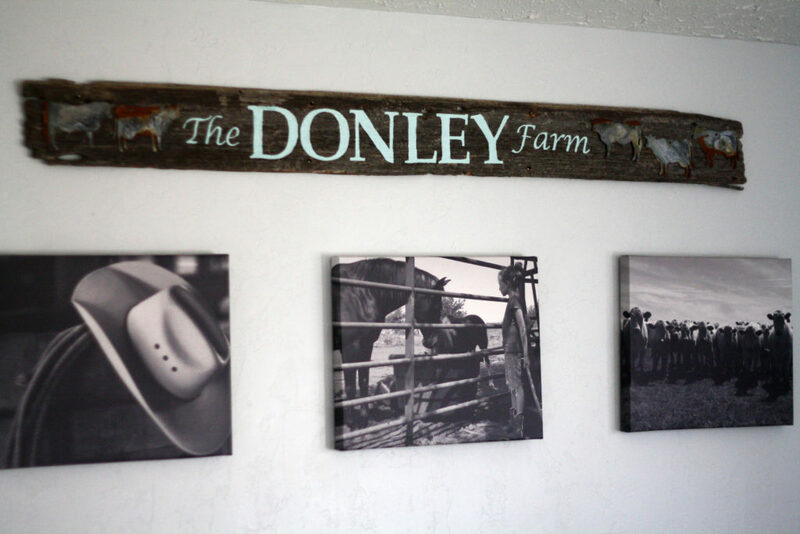 To narrow down my picture options, I just thought about what I wanted to portray in my house (easy- our life on the farm!). I initially narrowed it down to 6 pictures, but after trying out all six, the top three jumped out. Not all pictures worked as a canvas because of how it’s wrapped around. Sometimes the wrapping process cut off weird parts of the pictures. 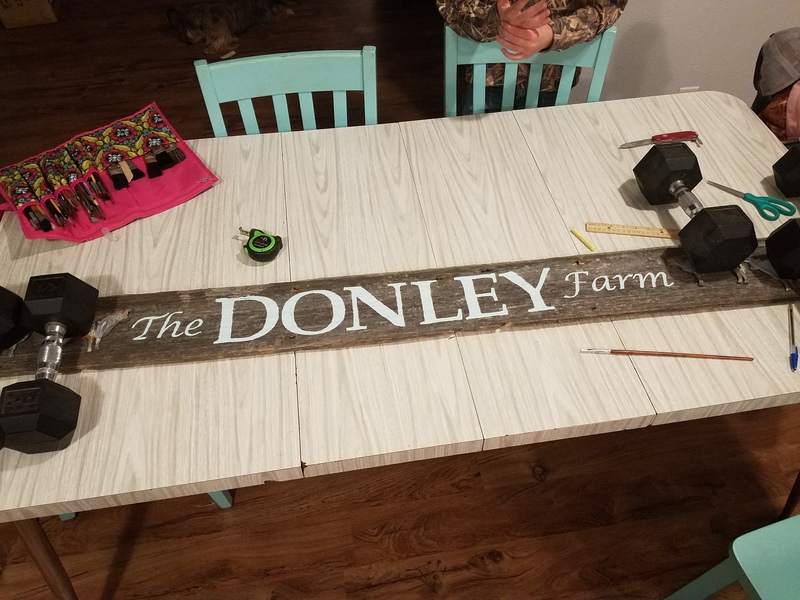 The farmhouse sign came together in three hours from ripping the wood off of the barn to putting the final coat of paint on the letters. This is my initial layout to see if I liked it! 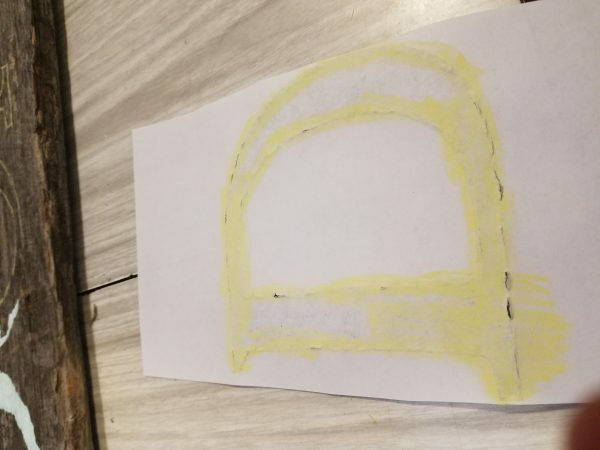 Here’s what my “D” looked like covered in chalk. You can see how the paper kind of ripped where I had pressed really hard when I was transferring it. I learned that the harder I pressed, the better! I just used leftover latex semi-gloss paint that I had from painting my bedroom 3 years ago. 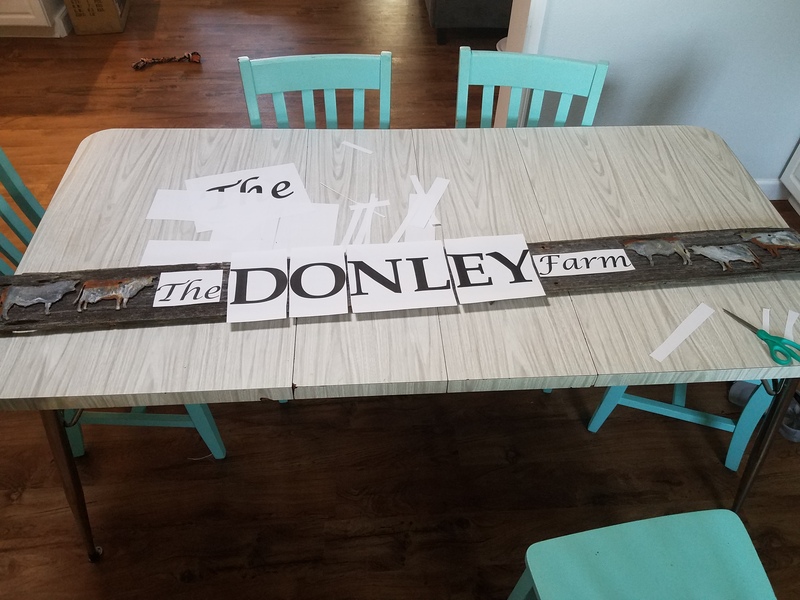 I then used Gorilla Glue to attach my 5 cows (the 2 bulls stand for Reece and Jeff and the 3 cows are me and the girls!). I stacked some of my dumbbells on the cows to hold them down (the wood didn’t lay perfectly flat). In the morning, it was all dry and ready to hang! I hung it using the existing nail holes. 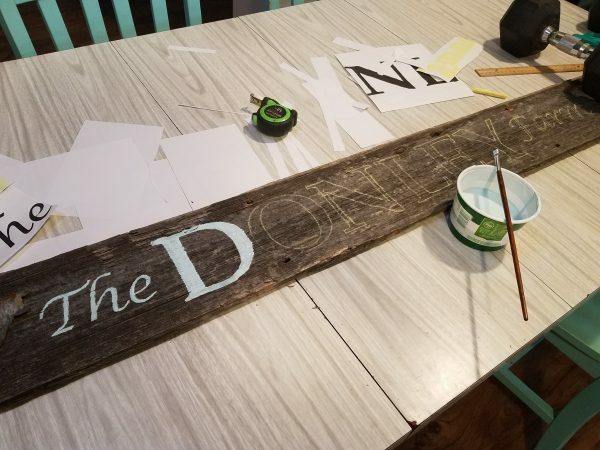 So, there’s your easy DIY farmhouse decor! And it only cost me $80 total. Not bad for 3 large canvases and a very large sign! 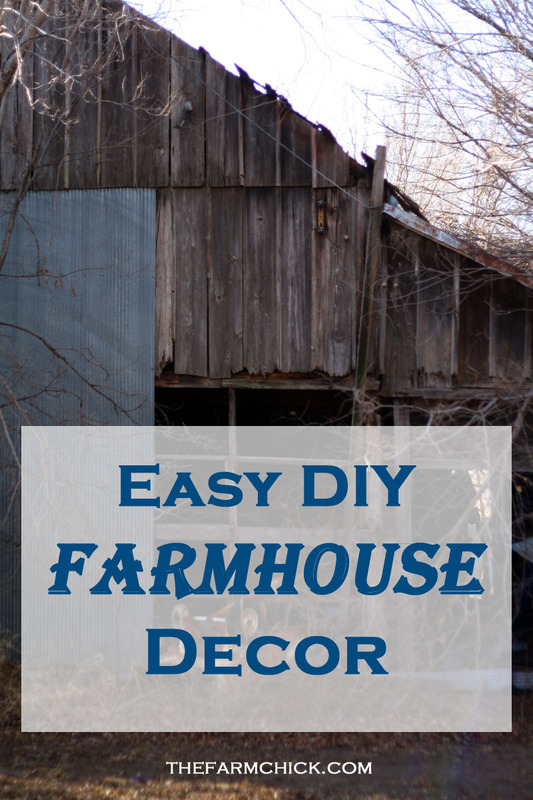 Do you have any of your own tips for decorating in the popular farmhouse style?